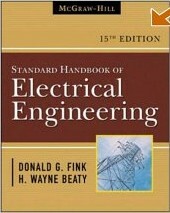 The Standard Handbook for Electrical Engineers has served the EE field for nearly a century. Originally published in 1907, through 14 previous editions it has been a required resource for students and professionals. This new 15th edition features new material focusing on power generation and power systems operation – two longstanding strengths of the handbook that have recently become front-burner technology issues. At the same time, the entire format of the handbook will be streamlined, removing archaic sections and providing a quick, easy look-up experience. Presents the definitive handbook covering the manufacture, transmission, distribution, measurement and use (including all the technical aspects) needed by engineers working with electrical systems. This is an accident-avoiding prescription for electricians, safety managers, and inspectors, and engineers dealing with electricity any voltage level. Presenting crucial protective safety strategies for industrial and commercial systems, the Handbook references all major safety codes (OSHA, NEC, NESC, and NFPA) where appropriate, creating a unique, one-stop compliance manual for any company’s electrical safety training and reference needs. The Electrical Safety Handbook is an easy-to-use, illustrated source of life-saving information tailored to fit specific work environments. The Electrical Safety Handbook is the reference professionals trust for up-to-date and easy-to-follow safety strategies in industrial and commercial electrical systems. The National Electrical Code® is an internationally accepted safety code for electrical and power wiring. It specifies the minimum provisions necessary for protecting people and property from hazards arising from the use of electricity and electrical equipment. 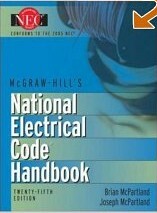 Anyone involved in any phase of the electrical industry must be aware of how to use and apply the Code on the job. It undergoes a rigorous review and revision process every 3 years by the National Fire Protection Association (NFPA). This book is a trusted resource for understanding and applying the Code®. It specifies the minimum provisions necessary for protecting people and property from hazards arising from the use of electricity and electrical equipment. The handbook presents key concepts in a simple, straightforward format without relying on complex math equations. Fundamentals, basic design, operating characteristics, testing, inspection, specifications, selection criteria, advanced fault detection techniques, troubleshooting tips, and maintenance issues are all covered. It also coveres the latest technological advancements and rules to keep your equipment running at peak efficiency. The handbook presents key concepts in a simple, straightforward format without relying on complex math equations. Fundamentals, basic design, operating characteristics, testing, inspection, specifications, selection criteria, advanced fault detection techniques, troubleshooting tips, and maintenance issues are all covered. 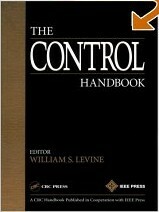 This is the biggest, most comprehensive, and most prestigious compilation of articles on control systems imaginable. Every aspect of control is expertly covered, from the mathematical foundations to applications in robot and manipulator control. Never before has such a massive amount of authoritative, detailed, accurate, and well-organized information been available in a single volume. Absolutely everyone working in any aspect of systems and controls must have this book! The Control Handbook is an ambitious and spectacularly successful effort to respond to this need. It is a most welcome addition to the literature in the field. It clearly sets a standard by bringing together a reference which will serve the scholar, the practitioner, and the student in one volume. A bestselling calculations handbook that offers electric power engineers and technicians essential, step-by-step procedures for solving a wide array of electric power problems. This edition introduces a complete electronic book on CD-ROM with over 100 live calculations--90% of the book's calculations. Updated to reflect the new National Electric Code advances in transformer and motors; and the new system design and operating procedures in the electric utility industry prompted by deregulation. 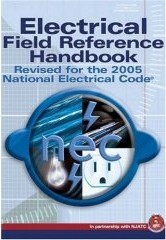 A reference for electrical engineers containing a wide range of topics, written by authorities on the subject. The CD-ROM has calculation procedures that allow the users to plug in their own numbers and get results, as well as the electronic version of the text itself. This book is useful for those working with: Static Drives, Static Controls of Electric Motors, Speed Control of Electric Motors, Soft Starting, Fluid Coupling, Wind Mills, Generators, Painting procedures, Effluent treatment, Electrostatic Painting, Liquid Painting, Instrument Transformers, Core Balanced CTs, CTs, VTs, Current Transformers, Voltage Transformers, Earthquake engineering, Seismic testing, Seismic effects, Cabling, Circuit Breakers, Switching Surges, Insulation Coordination, Surge Protection, Lightning, Over-voltages, Ground Fault Protections, Earthing, Earth fault Protection, Shunt Capacitors, Reactive control, Bus Systems, Bus Duct, & Rising mains. An all inclusive source for the electrical power engineer or electrical engineering student who needs a single source reference guide to every subject contained within that discipline. 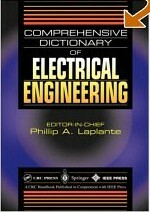 This complete lexicon covers all the fields of electrical engineering. The book provides workable definitions for practicing engineers, serves as a reference and research tool for students, and offers practical information for scientists and engineers in other disciplines. Areas examined include applied electrical engineering, microwave engineering, control engineering, power engineering, digital systems engineering, and device electronics. It provides comprehensive, current definations of electrical engineering terms. Serves as the most complete refrence for electrical engineers and scientists. Enhances general electrical engineering literacy. 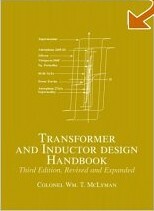 Extensively revised and expanded to present the state-of-the-art in the field of magnetic design, this third edition presents a practical approach to transformer and inductor design and covers extensively essential topics such as the area product, Ap, and core geometry, Kg. The book provides complete information on magnetic materials and core characteristics using step-by-step design examples and presents all the key components for the design of lightweight, high-frequency aerospace transformers or low-frequency commercial transformers. Written by a specialist, this volume covers magnetic design theory with all of the relevant formulas. Along with all of the practical design examples, the book is filled with clear and well-annotated illustrations and circuit schematics. This book is recommended for college and university libraries serving electrical engineering department and libraries serving practicing electrical engineers. This book identifies and solves problems in the principle branches of electrical engineering.Many equations and examples are used to help explain the theory along with some very helpful explanations on how certain quantities are arrived at. This advanced textis well suited for practical electrical engineers who need to revisit the details of calculations and obtain a new understanding of the underlying theory. This book is recommended for college and university libraries serving electrical engineering department and libraries serving practicing electrical engineers. 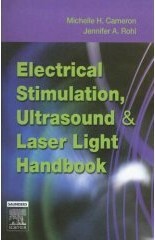 This one-of-a-kind handbook is an excellent, quick-reference refresher on key points related to the appropriate and effective use of electrical stimulation, ultrasound, and laser light in clinical rehabilitative practice. In a convenient outline format, it summarizes the basic principles of how these modalities work and presents guidelines for clinical applications - including the use of electrical stimulation to manage pain, produce muscle contractions, and increase local circulation. It includes clear photos and line drawings on nearly every page of this densely illustrated book provide at-a-glance reference and instruction, ideal for the clinical setting. Recommended applications and treatment parameters are provided to guide the practitioner through special tests. The CRC Handbook of Electrical Filters fills in the gaps for engineers and scientists who need a basic introduction to the subject. Unlike the currently available textbooks, which are filled with detailed, highly technical analysis geared to the specialist, this practical guide provides useful information for the non-specialist about the various types of filters, their design, and applications. The handbook covers approximation theory and methods and introduces CAD packages that perform approximation and synthesis for both analog and digital filters. Also included are design methods for LCR, active-RC, digital, mechanical, and switched capacitor (SC) filters. All the cost data you need to keep your estimating accurate, competitive and profitable. Specially written for contractors and small businesses carrying out small works, Spon's Estimating Costs Guide to Electrical Works provides accurate information on thousands of rates, each broken down to labour, material overheads and profit for residential, retail and light industrial premises. It is the first book to include typical project costs for new installations, stripping out, rewiring and upgrading for flats and houses. This book will help you to: Produce estimates faster; Keep your estimates accurate and competitive; Run your business more effectively; Save time. This Handbook gives power supply designers practical, solutions-oriented design guidance free of unnecessarily complicated mathematical derivations and theory. This thoroughly updated Handbook features many new fully worked examples, as well as numerous nomograms everything you need to design today's smaller, faster, and cooler systems. Turn to any page, and you'll find cutting-edge design expertise on electronic ballast, power factor correction, new thermal management techniques, transformers, chokes, input filters, EMI control, converters, snubber circuits, auxiliary systems, and much more. The most comprehensive book on power supply design available anywhere, Switchmode Power Supply Handbook is the industry standard fully updated. 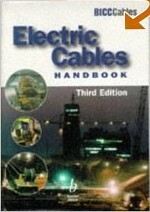 Electric Cables Handbook provides a comprehensive and substantial coverage of all types of energy cables from wiring and flexible cables for general use, to distribution, transmission and submarine cables. It includes information on materials, design principles, installation, operating experience and standards, and several appendices contain extensive data tables on commonly used cable types and their properties. This book is an extensive source of up-to-date and essential information for electrical engineers, contractors, supply authorities and cable manufacturers. The Third Edition has been substantially revised with new sections of chapters on high temperature superconductivity, optical fibres in power transmission systems and communication cables. The Mechatronics Handbook provides a unique, detailed overview of this vibrant, dynamic field and sets forth its state of the art. More than 60 articles authored by a stellar panel of academics and practitioners explore every facet of the field, from an overview of its history, through the underlying theories, systems, processes, and practice to perspectives on the field's current and future trends. The Mechatronics Handbook is a landmark work that is both your portal to that world and your roadmap through its intricacies. This book is a prime example of such a new compilation of basic sciences and engineering knowledge from the mechanical engineering, electronic engineering, and computer and information sciences fields. Optimal Control Systems provides a comprehensive but accessible treatment of the subject with just the right degree of mathematical rigor to be complete but practical. It provides a solid bridge between traditional optimization using the calculus of variations and what is called modern optimal control. It also treats both continuous-time and discrete-time optimal control systems, giving students a firm grasp on both methods. It includes summary table that accompanies each topic or problem and includes a statement of the problem with a step-by-step solution. Provides an accessible yet comprehensive treatment of the subject of optimal control systems. Offers numerous exercise problems, and provides a solutions manual with qualifying course adoptions. This book is for those who need to know about electrical injuries and their causes and implications. It uses non-technical terms to explain the nature of the various kinds of electricity, and is invaluable to attorneys, physicians, nurses, engineers, and expert witnesses who deal with electrical accidents that result in injury or death. This book gives you a background in terminology and principles of electricity and how they relate to electrical injuries. This book enables you to understand the impact of electricity flowing through the body. You will read about fatal and non-fatal accidents that occur in the home, in industry, in medicine, and in the outdoors. This handbook presents, in a single concise and authoritative publication, the elements of these diverse areas relevant to digital color imaging. The first three chapters cover the basics of color vision, perception, and physics that underpin digital color imaging. The remainder of the text presents the technology of color imaging with chapters on color management, device color characterization, digital halftoning, image compression, color quantization, gamut mapping, computationally efficient transform algorithms, and color image processing for digital cameras. Each chapter is written by world-class experts and largely self-contained, but cross references between chapters reflect the topics' important interrelations.